all sorts of really cool things!! 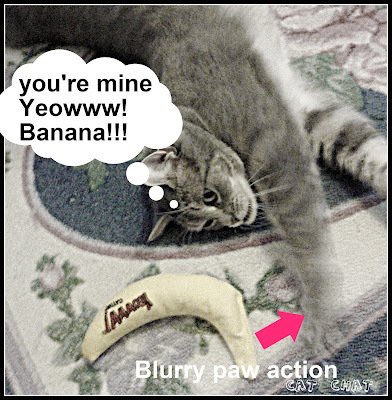 When they named this delectable banana YEOWWW! they weren't kidding! Wanna see? Check it out! The catnip in this is catabulous! Don't believe me? Watch! I was not compensated for this post. I was just given my catnip "fix", that's all, I promise. All opinions are my own however tainted by a catnip haze that they might be. HA! I'm getting high on a nip nanner too! All of my cats love the nip nanner!! The outside feral cats really love them! Best toy ever! Those YEOWWW! nip bananas are so powerful I am amazed they are legal! I don't have the bananna, but I've got a tin of Yeowww sardines and a big red Yeowww tomato and I LOVE them!!! Better not Yeowww and drive, Cody. 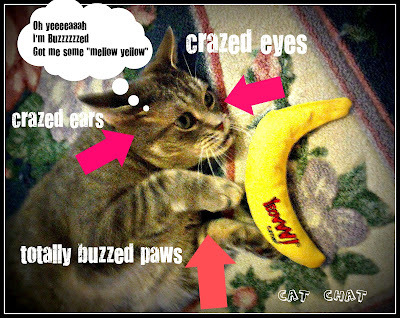 Mommy brought home some bananas but they don't smell like catnip at all! 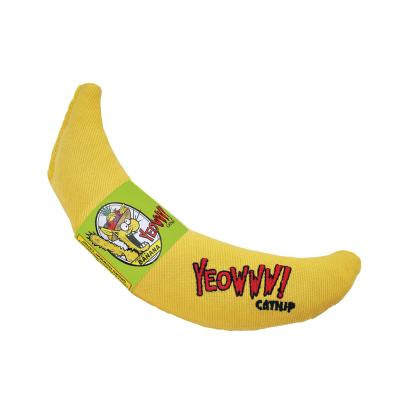 We've heard such good reviews on the Yeowwwww Banana but Mommy says we aren't really nip kitties so she isn't going to order one for us (can't get it locally so will have to get it online). That does look like a great nip nanner. We will have to check out that store. Thanks for that good review. Take care. Hmm.....I might have to ask my Mommy about that banana....I'm not much on catnip BUT I do love new toys and something tells me that's just the right size for batting around the house!! Thanks for the tip on the nip Cody! I always get a kick out of watching my mom's cat get ahold of the cat nip--doesn't matter how old the cat is, she still enjoys a little "nip" every now and then!!! Cody, my Billy also goes CRAZY over the Yeowww banana. My cat Sammy doesn't respond to catnip and always seems confused as to why Billy is suddenly acting so crazy. We have a nip nana too from another shop but it is just a fun and catnippy!!!! I love that banana! it made me think of Banana Split, yum yum!!! Oh Cody! How much fun can a crazed cat have if a crazed cat can have fun!!! Well - I think you just showed the world! Cody my love! Watching yous in action is making me drool! Yes... the banana is your!!!!! WeeeeeeeeeeeOooooooooooo! And fruit is good for you! Hehehe! Cody and Austin have the same addiction. It even gives them the same crazed look!! Loved the vid :) Austin wants to move to A Merreekah!! Cody you are so right! That banana looks wonderful Cody. My mommy bought both Admiral and me that very rnip nanner. I love it. So did the Admiral. I will be to see you and Dakots next Saturday. My tunnel will bring me. 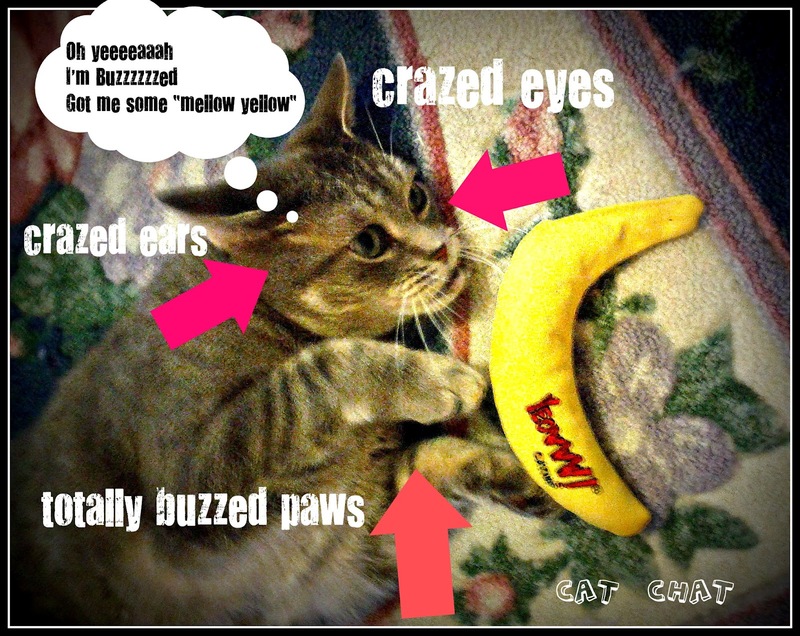 They have these yeller nanners at the vets and we wondered how good they are. Thank you so much for your kind condolences on the passing on my mom. The support of friends like you and the manner of her passing have been a great comfort. Thanks, Caren, we love you. We love our nip nanner! Mom would get us two, but she's afraid Lucy would hog them both......... she doesn't like to share.